My second short story collection, Overload: Stories For When Your World Turns Upside Down (which feels like it has taken forever to finish), releases July 10th. Curious about the final cover? Here it is. Scroll down for excerpt from the first story titled "Scream". Read and enjoy! Park bench. White. Pretty flowers. Quiet. It’s perfect. Just like I used to be. I’m burying my dreams in the dark tonight. My parents’ dreams. Will’s dreams. Brad’s dreams. Even a few of my own. Rings represent dreams, or so I’ve been told. Some people have theirs come true. Not me. Not Josie. And definitely not Will. Mom tells me promise rings don’t mean as much as they used to. Promises get broken all the time. Nobody cares anymore. I promised Will I would hold out. I promised him I would wait for him. Keep myself pure and holy, all that good stuff. The specific words of that promise bounce around in my head as I stand in front of the bench, flashlight aimed at the hole underneath it. I need to get a move on. Park closed over an hour ago, and high school kids use the far end after hours to get high. Cops will be coming around soon to run everyone off. All good reasons to get this done. So why the death grip on the rings clutched in my fist? Why not drop them in the hole, fill it in, and be done? Because the pain and the shock and numbness coursing through my veins are the same right now as they were the day they lowered Adam into the ground and handed my parents a folded-up flag. My brother the soldier - dead in a war no one can win. Opposition forces put an IED on the road his caravan was driving on. Closed casket, no viewing. His vehicle's spot in the caravan was at the center of the explosion. And his death was the device that ripped through my life. I don’t know who got hurt the worst in all of this. Josie, Adam's brown eyed girl with a ring on her finger and a promise that she could set a date for the wedding, is high on the list. Mom and Dad. Craig, baby brother who worshiped Adam's every step. Ari, Will's older sister and Adam's best friend since we moved here. If you ask me, Will is the most obvious answer to the question. I betrayed him. All these years, I can hear people saying, and she was just using him. I know I hurt him. Anyone who was there to see the hurt spreading across his face knows it as well as I do. They would be the ones to know why walking away was the only thing I could let him do. He was too good for me, and I couldn’t hold onto him. I couldn’t give him any other choice. Grief is a good excuse to hide behind, but a horrible reason to hook up with someone you're not planning to marry. Like Brad, the guy who used to be one of your best friends. A bright flash of light socks my eyes in the pupils, too much for them to absorb all at once. I blink, raise a hand to shield my eyes from the flashlight aimed at my face. "Yeah, Shane," I say, combining the words with a short sigh. "I know it's late. I was just about to take off." "Take your time," Shane, newest officer slash neighbor slash church member says, finally flicking the light down towards the ground. "The kids tried to make it a party tonight, and not a small one, so it's going to take a while to sort everything out there. I'm surprised you didn't hear the music. Half the neighborhood called in with noise complaints." I'm not. Guilt consumes my capacity for thought these days. I don't process much of the world outside of me that isn't right in front of my face. Mentally, I shrug. I wait until I can't see Shane's flashlight anymore to lean over and drop the rings into the hole. My fingers clumsily shove the pile of dirt over them and pack it down. Will didn't want them back. Our relationship is dead, and I don't want them either. Symbolism can be a beautiful thing, when the sentiment doesn't smack you in the face. Or punch you in the gut. When I get up, I slip my foot under the bench in one last attempt to push the dirt back down into the earth. I wish I could bury my feelings so neatly. All I can do is shove them down and hope the explosion doesn't happen in a place where anyone can witness the destruction. And I'm long gone by the time anyone comes back around. Was that enough to catch your interest? 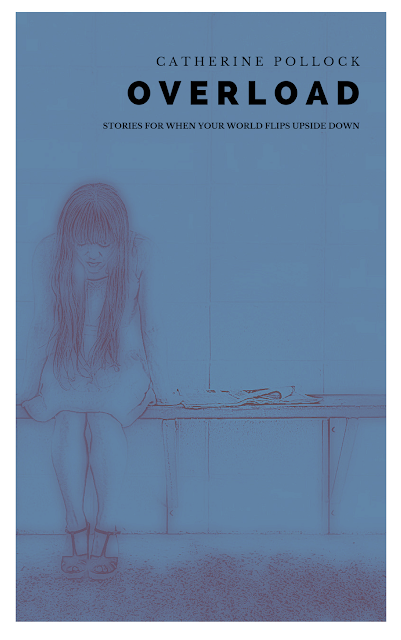 Overload: Stories For When Your World Turns Upside Down will be available for preorder soon. Watch for an announcement on my social media accounts and check here on the blog for links to the sites it is available on.